The "boil-up" is a Maori method of cooking that boils root vegetables such as kumara and potatoes, puha (watercress) and spinach in a pork stock. Dumplings, also known as "doughboys", or Maori bread usually accompany the meal to soak up the soupy goodness. 1 Add the chicken stock, 2 cups of water and pork bones to a large stock pot. Bring to the boil and simmer for 1 hour. 2 Soak the watercress in cold water for about 10 minutes and then wring it out to get rid of the bitter juices. Set aside. 3 Add the kumara, 1/2 white onion, tomatoes and spring onions to the soup stock. Simmer for 15 minutes. 4 Cut the pork filet into 1 inch slices and add to the stock. Add salt and lower heat and cover pot. Simmer gently for 15 minutes. 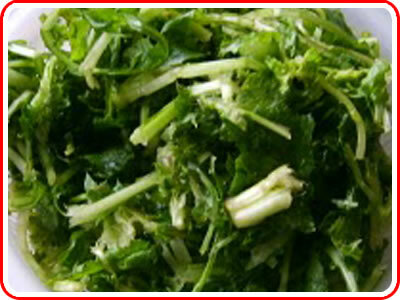 5 Finally, add the watercress and stir well. Remove the pork bones from the stock and discard. 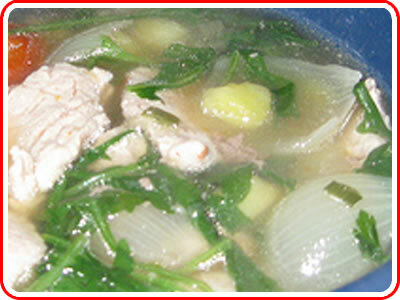 6 To serve ladle the hot soup over the meat and vegetables and garnish with sliced spring onions.